Mujahideen positions in Derna were hit by Egyptian warplanes today in relation for the massacre of 28 Christians in central Egypt’s Minya province this morning. Another 25 Egyptian Christians were wounded. 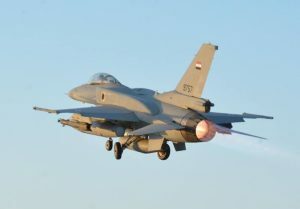 According to the Egyptian authorities, there were six strikes, hitting what they claimed were “terrorist bases”, including the headquarters of the Derna mujahideen. They were ordered by President Abdel-Fateh El-Sisi who said that Egypt would “not hesitate to strike terrorist camps anywhere, inside or outside Egypt”. Countries that harboured and trained terrorists had to be punished, he added. Egypt claims that the Minya massacre had been organised with the help of militants in Derna. However, the Minya killings are thought to have been carried out by the so-called Islamic State while the militants in Derna are the mujahideen who are linked ideologically to Al-Qaeda. There are no details of casualties of the Derna strikes at present. The Minya massacre was this evening condemned by the president of the House of Representatives, Ageela Saleh, who called it a “heinous act of terrorism”. He said that the HoR stood with Egypt in the war on terrorism.